Grand Avenue passers-by will no longer be looking to "Obey." On Wednesday morning, the art installation "Obey Revolutions Mural" by artist Shepard Fairey was gone and a painter could be seen covering the viaduct with a fresh coat of white paint. 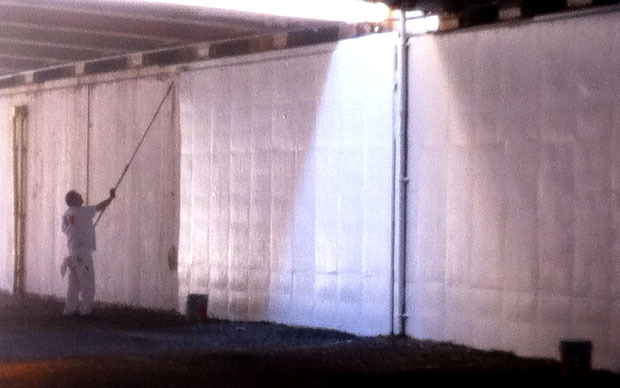 The mural was installed last May as part of the Navy Pier Walk 2011 art exhibition. Fairey was best known for his creation of the Obama "Hope" posters that were ubiquitous at the time of the 2008 presidential campaign. 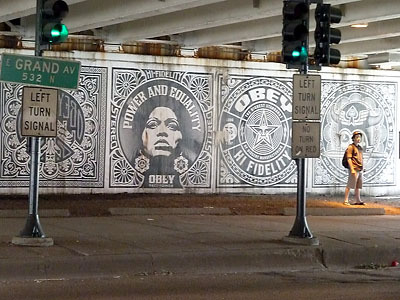 The artwork displayed black and white panels, depicting ads for an "Obey" Records, an extension of his "Obey Giant" sticker campaign. The work seemingly spoke out against censorship and oppression, with a display of a megaphone blasting the obey logo, with an arrow labeled &apos;convenient&apos; and a plane dropping records in a manner similar to a bombing. A spokesperson for Navy Pier, a partner in the art venture, was not immediately available for comment about future installations.